Born in the rural countryside near Santo Domingo in the Dominican Republic, Joan Soriano fashioned his first guitar from a tin can and fishing line and has never looked back. Soriano plays steel string bachata with equal parts romance and grit. The Afro-infused rhythm that permeates his music has made him a favorite among dancers. As a boy Soriano received little formal education. The seventh of 15 children, he left school to help his father farm the family’s land. But Joan’s destiny was for something else. Forming a band with his young brothers and sisters, he began to perform at neighborhood events. Nicknamed “Los Candes” (after their father Candelario), the band became a local sensation. At 13 Soriano hitched a ride to Santo Domingo and cut his teeth working with some of the island’s greatest bachata stars. Bachata is essential to Dominican culture and draws upon a variety of influences from Africa, Europe, Latin America and the Caribbean. A practitioner of palo and gaga, Soriano blends Afro-Dominican sacred traditions with bachata, preserving and expanding upon bachata’s roots, combining the new and old. Soriano is the star of Adam Taub’s new documentary, The Duke of Bachata. 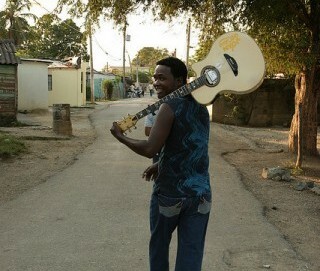 He also was featured in the documentary, Santo Domingo Blues, and is on The Rough Guide’s Bachata compilation. Soriano has performed throughout North America and Europe. His latest album, El Duque de la Bachata, was recorded live in a Santo Domingo. This engagement of Joan Soriano is made possible through Southern Exposure: Performing Arts of Latin America, a program of Mid Atlantic Arts Foundation in partnership with the National Endowment for the Arts. During their visit to Tulsa, Soriano and his band will visit Lee Elementary School for an interactive music program with the kids.